You know the situation. The one where you’re in a public place and there’s a group of kids acting silly, getting dirty looks. Everyone around you (and them) is irritated with their lack of respect for the people around them. They’re unsupervised and you know it. As a teacher, we are trained to react to these situations. I have to admit that I sometimes have to bite my tongue at times like these to keep me from using my “teacher voice” out in public. But when it comes to friends and family, I often use it without thinking about it. My husband often reminds me that he is not one of my students. 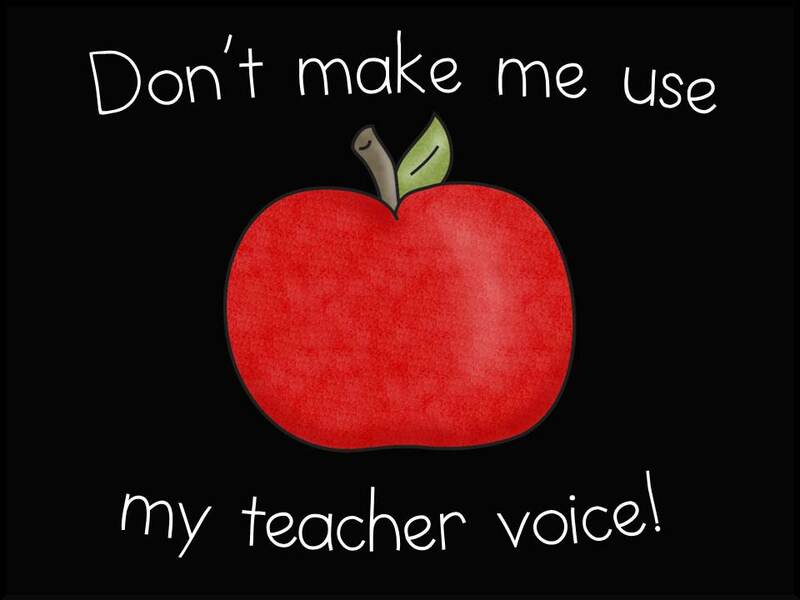 Have you ever caught yourself using your “teacher voice” out in public? For me, it always happens in the movie theatre! Cute graphic! Actually, since I'm not teaching right now, I wok in retail. One day I saw three boys running UP the down escalator, and out came my teacher voice. WE DO NOT RUN ON ESCALATORS! You should have seen the looks on their lowered faces as they stopped short and passed me as they came back down. It was awesome! Hahahahaha! Too funny! That sounds EXACTLY like something I would do! :P Thanks for sharing! If you are a K teacher, you need to make sure you don't sing instructions at the wrong time. Trekking your teenage kids and their friends that dinner is ready is the wrong time. Oh my gosh! That's too funny! Again, something that I would do!